New Steinway Pianos For Sale Now at our Leeds showroom. Designed by Steinway And Sons. 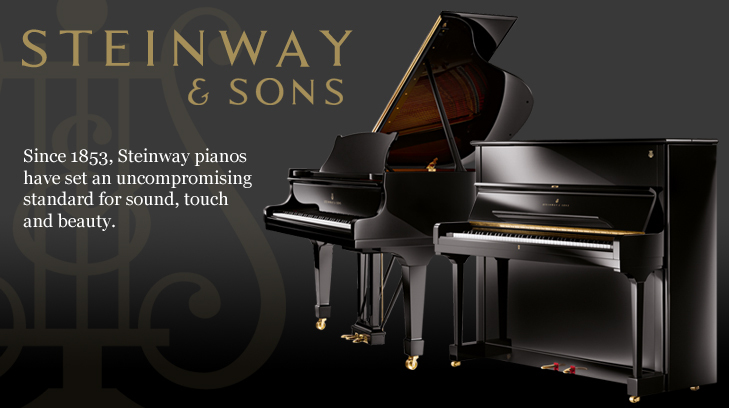 "Since 1853 Steinway pianos have set an uncompromising standard for sound, touch, beauty and investment value. Every Steinway piano is individually handcrafted and takes over a year to build from the finest materials available, with knowledge passed down through many generations. A Steinway piano is an enduring investment and we invite you to personally discover why it has become the standard by which all other pianos are judged. 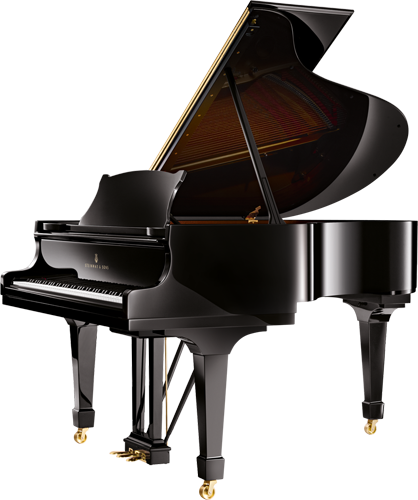 Steinway pianos are the preferred choice of 9 out of 10 concert pianists." 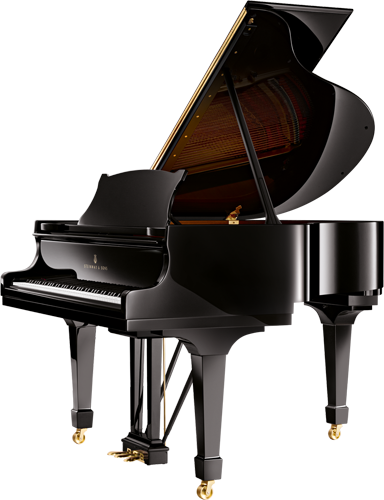 Besbrode Pianos are able to offer the complete range of brand new Steinway pianos. We always have a selection of new Steinway grand and upright pianos ready to play at our showroom, however if you are looking for a specific model or finish, we recommend you contact us to ensure we have your model in store ready for you to try. Below we have outlined the specification for each Steinway piano model available and wood finishes available. 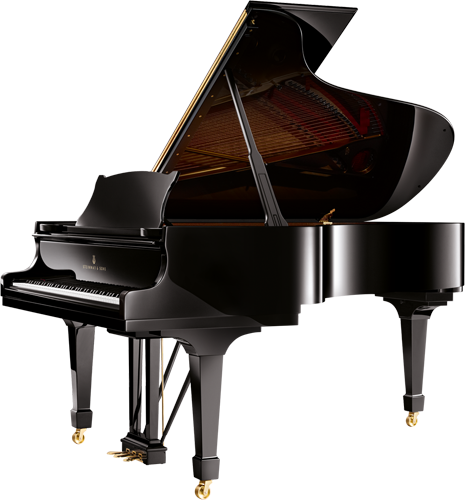 All Steinway pianos are available in standard popular finishes. Steinway also offer a "Crown Jewel Collection", these are their piano models made from the most exquisite woods available in the world today. The owner of a Steinway Crown Jewel will own a work of art which is totally unique. Steinway call this their "Parlour Grand". A smaller sized concert grand piano, intended for use in schools and colleges. A great choice when space is at a premium. The rim of the Steinway model A grand piano is made entirely from hard rock maple and mahogany; laminations; continuous bent, both inner & outer form one single rim; unequaled strength and stability. 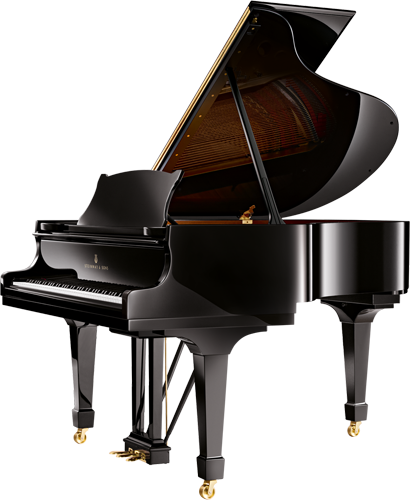 The Steinway model A grand piano has 4 braces made of solid spruce; spruce provides tensile strength with less weight. Maple dowels fasten braces to rim producing a single homogenous foundation upon which is built the entire tonal component. A cast iron treble bell, affixed to rim's underside at treble bend, holds plate firmly in position by means of a steel bolt. The S & S iron wedge anchors brace ends securely to crossblock assuring permanent rim posture. The Steinway model A grand piano incoporates the Hexagrip patented design; 6 laminations of quartered hardrock maple and bubinga stock. Grain symmetrically distributed at successive angles of 45° or 90° employing grain direction uniformly around the circumference of the tuning pin to provide the ultimate in pin grippage. As a result of this exclusive design, the tuning pin has smoother movement under torque, a more uniform retaining which will hold its tuning longer. The soundboard on the Steinway model A grand piano is created like the soundboard of violins to give a free and even response throughout the entire scale, it is so constructed as to be 9 mm thick in the center and tapered to 6 mm as it approaches the rim and outer case before being DOUBLE CROWNED. This design permits complete freedom of movement, while acting as a homogenous unit to displace a greater amount of air, thereby creating a richer and more lasting tonal response. Close-grained, quarter-sawn Sitka or European spruce, a wood having unusual stability and vibrance under stress and vibration, is used exclusively for the soundboard. The Ribs on the Steinway model A grand piano are made from durable spruce to assure strong and constant support of string down-bearing on the soundboard. Rib ends are hand-fitted into their mounting surfaces virtually locking in the important soundboard crown. The bridges on a Steinway model A grand piano are made accordingly: Treble: Hard rock maple vertical laminations capped with solid hard rock maple; planed to prescribed height, graphite coated, drilled, and notched by hand for precise individual string bearing. Design defies splitting. Bass: Continuous with treble. Maple doweled, glued, and screwed to soundboard. .
Sturdy grey iron; filled, CNC-milled, and sealed; bronzed and lacquered. Steinway call this their "Music Room Grand". It is created for a larger space with recital halls, auditoriums or recording studios in mind. Treble: Hard rock maple vertical laminations capped with solid hard rock maple; planed to prescribed height, graphite coated, drilled, and notched by hand for precise individual string bearing. Design defies splitting. Bass: Continuous with treble. Maple doweled, glued, and screwed to soundboard. . 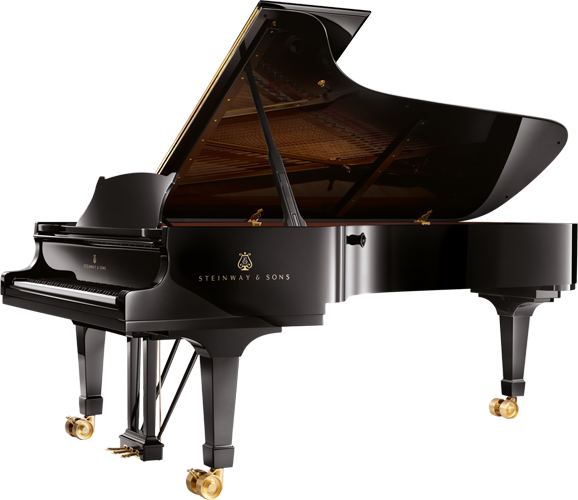 The Steinway Model C is Steinway's Concert Grand Piano Model. This model is designed for smaller sized concert halls. 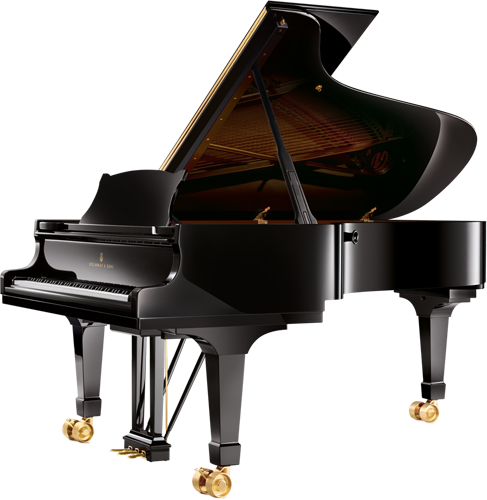 The Steinway Model D is the orchestral Concert Grand Piano, The jewel of Steinway's crown. Sturdy grey iron; filled, hand-milled, and sealed; bronzed and lacquered. The Steinway Model M is a grand piano small enough to fit in your home or flat. Treble: Hard rock maple vertical laminations capped with solid hard rock maple; planed to prescribed height, graphite coated, drilled, and notched by hand for precise individual string bearing. Design defies splitting. Bass: Solid rock maple mounted to cantilevered and splined base. Maple doweled, glued, and screwed to soundboard. . 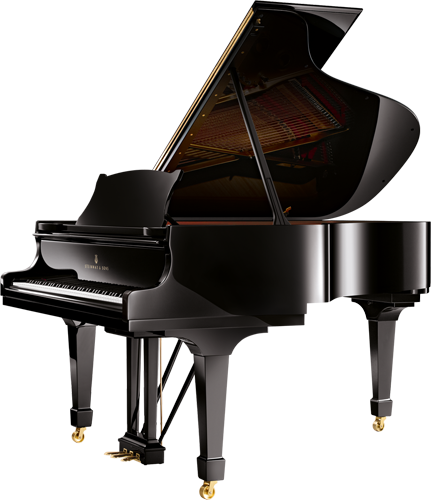 The Steinway Model O is a great grand piano for the professional musician. Still small enough to fit in smaller spaces. 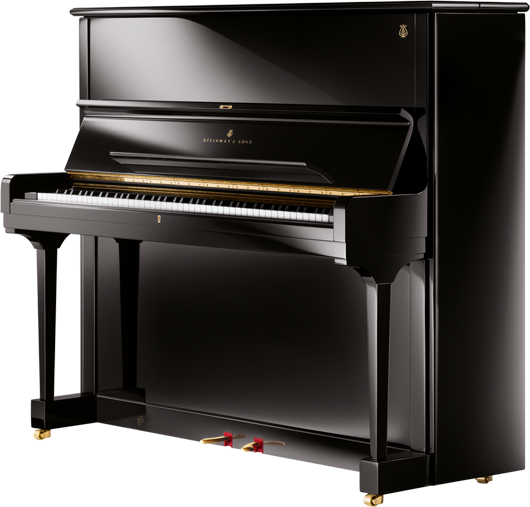 The Steinway Model O piano is made entirely from hard rock maple and mahogany; laminations; continuous bent, both inner & outer form one single rim; unequaled strength and stability. This is a small grand piano for home use when space is limited. 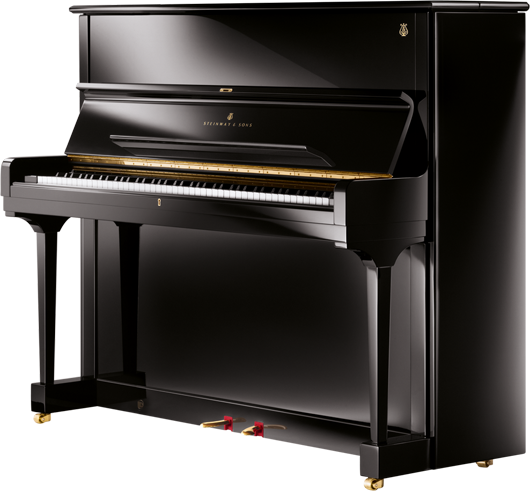 A first-step, smaller upright of unmistakable Steinway quality.